My Trip of a Lifetime – 2 Four Stars in Two Weeks! Ever since I was a teenager, I dreamed of being a spectator at the famous Badminton Horse Trials. As a horse mad kid in the ‘80s I had read lots about the prestigious event, but it wasn’t until I saw a video in 1993 that I was completely transfixed – it was immediately on my to-do list! Little did I know it would take me 18 years to fulfil the dream…school, uni, work, marriage, buying a property all took priority. Then suddenly my long service leave was due and planning of the dream holiday started to take shape…I even convinced my husband to come with me! The more I started to scheme and dream, the bigger the trip got. So the plan was to spend four days in London, do an 8 day tour through Europe (The Netherlands,Germany,Switzerland and France) and spend some time in Cotswolds country before heading to Badminton. 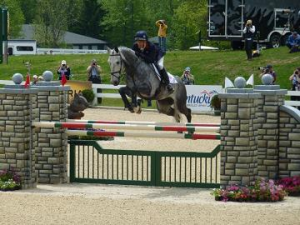 I knew the Rolex Kentucky 3DE in Lexington,USA was due to start the week following Badminton and worked out we could immediately jump on a plane and go to Lexington too – and then see two legs of the ‘Grand Slam’. This then meant my husband could catch up with one of his school friends now living in the States, so our itinerary grew to include North Carolina and New York before flying home. All in all, 5 weeks of walking, planes, trains and automobiles whilst exploring the world. On returning to England after our Europe tour, we went to Bedford and then onto Swindon. Here I was very fortunate to be able to visit Wickstead Farm, where Paul Tapner is based. It was great to meet Paul and his horses, including the 2010 Badminton champion, Inonothing and Paul’s 2011 contender, Kilfinnie. 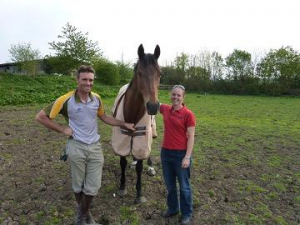 It was interesting to see how an English eventing yard works and look at the wonderful facilities Paul has at his disposal – including an indoor and outdoor school, cross country course and an equine spa! From Swindon we visited Cirencester (where I went riding) and then spent a lovely couple of days in the historic city of Bath. From there it was onto our guest house in the quiet village of Nettleton, 5 miles from Badminton Park. Another little highlight of our stay in Nettleton was walking to the historic village of Castle Combe, where town scenes from the upcoming Spielberg movie, ‘War Horse’ were filmed – look out for it in the movie! Although I had been dreaming of this adventure for so long and had watched videos year after year, nothing quite prepared me for the Badminton experience. The atmosphere is very special – upon arriving at the event and heading toward the temporary stadium, you pass the official scoreboard…still an old blackboard, painstakingly hand painted throughout the weekend. Another highlight of course was walking past the beautiful Badminton House – I had to pinch myself to believe I was finally there! Even on Friday, the first day of dressage, the place was abuzz. The sheer scale of the event makes our Aussie major events seem tiny. The first thing we checked out of course was the trade stands! Talk about horsey shopping paradise…over 300 trade stands, bars, an extensive food court, the place had everything. I took the opportunity to go shopping before sitting down to watch the afternoon session of dressage. For many people, watching dressage is the ‘boring’ part of eventing, however I was completely mesmerised. So many super tests were ridden over both days and I marvelled at the ringcraft, execution of movements and exceptionally high standard shown. After the two days of dressage, the British riders dominated, with Ruth Edge in the lead on Two Thyme, followed by Piggy French and Jakartain second place and Laura Collett on Rayef third. The best Aussie performances came from Lucinda Fredericks with Prada and Sam Griffiths on Happy Times, in 20 and 21st places respectively. Overall the standard was very high, with the top 18 in the field scoring above 70%! Another highlight of the dressage days was watching the excellent demonstrations by British dressage rider, Carl Hester during the lunchbreaks. We also took the opportunity to take part in a course walk led by Paul Tapner, run as a fundraiser for Cancer ResearchUK. 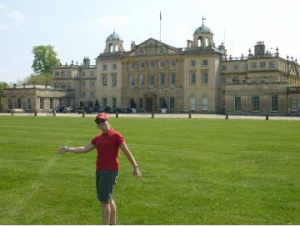 After looking at the enormous Badminton course, it now puts my course-walking nerves into perspective! The terrain and distance also surprised me, as watching on TV you don’t appreciate the distance between some of the fences and the stretches on an uphill slope. Cross country day dawned and we arrived early to beat the streams of traffic. There’s nothing like being on course with 200,000 spectators to watch 80 of the world’s best eventers. 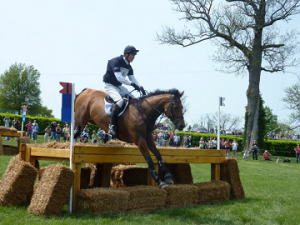 First horse on course was Avebury, ridden by the brilliantNew Zealandrider, Andrew Nicholson. Everyone anxiously watched his progress on the big screens, and he made it look deceptively easy, home clear under time. As the day progressed though, it was apparent that time was not easy to make (with the weather being ‘hot’ – about 25 degrees) and the course claimed its share of victims. It was impossible to get close to The Lake precinct; you could hear the buzz from that area from a long way away. The day was just amazing, my lasting memory though will be of sitting in the main grandstand as the last 15 or so horses left the start and returned to the finish, whilst we monitored their progress on the big screen. The roar of the crowd as each horse crossed though the finish flags was intense. The crowd went wild when Mark Todd and NZB Land Vision stormed across the finish to take the lead! Marina Kohncke of Germanymoved up to second place on Calma Schelly and the wonderful expressive Opposition Buzz jumped into third place with Nicola Wilson. Of the Australian riders, Sam Griffiths put in a magnificent round to move up to 8th with Lucinda Fredericks in 20th and Paul Tapner in 21st. Showjumping day proved to be very exciting, with only one rail separating the top 12 placings! In the end, it was another Badminton victory for Mark Todd with NZB Land Vision – an amazing performance given his recent return to the sport. Piggy French and Jakartafinished second and Mary King was third on Imperial Cavalier. Sam Griffiths finished 4th with Happy Times, the best of the Aussies. Along with the presentations, we saw the retirement ceremony of William Fox-Pitt’s amazing horse, Tamarillo. After the excitement of Badminton, it was then time to quickly return to London that evening for an early morning flight to Chicago, then Lexington the next day. We checked in at Heathrow at 5am (!) and noticed we weren’t alone…Mary King and William Fox-Pitt were amongst other early morning travellers spotted at Heathrow ready for the trip to USA! This leg of our trip was the most gruelling, with the change in time zones and delayed flights making our day well over 30 hrs. It was 11pm in Lexington by the time we reached our hotel. We were awoken the next morning by tornado sirens….totally bizarre and we weren’t sure if we should be panicking or not….none of the locals seemed to be worried! Luckily we had a quiet day to explore the local surroundings, pick up a hire car and adjust to driving on the other side of the road! In contrast to Badminton, the Kentucky experience was very different. Badminton is staged on the Duke of Beaufort’s estate and everything is temporarily constructed, whereas the Kentucky Horse Park is a permanent facility with a magnificent stadium and so much to see and do. As with Badminton, there was plenty of shopping to be done – and for our convenience, there was even a big screen in the main trade area so you could watch and shop! The shopping had to be seen to be believed with bargains galore…there was a lot of shopping I arranged to get posted home!! After the two days of dressage, the leaders were Tiana Coudray and Ringwood Magister, with Mary King on Fernhill Urco in second and Allison Springer and Arthur third. Of the Aussies, Clayton Fredericks put in a good test on Be My Guest to be 10th and Hamish Cargill (of ‘Hamish and Dave’ fame) was 14th with Sandhills Tiger. Once dressage was completed, it was time for yet another course walk. The amount of rain in the lead up was apparent, with pumps everywhere to drain water off the course. The sunken road was actually turned into another water jump of sorts, with water in the bottom of the pit! It was a beautifully presented course with big, bold fences. The going seemed good given the huge amount of rain. turned out to watch an exciting day of action. We alternated our vantage points, starting at the sunken road and worked our way around a lot of the course and did manage to catch a glimpse of theLakecomplex! The British based contingent dominated the field with Mary King riding her fabulous horses into first and second place. Super rounds from William Fox-Pitt and Clayton Fredericks also saw them move up the leader board, along with young American rider Sinead Halpin. commentator really worked the crowd to enhance the atmosphere and excitement. It was a thrilling finish, seeing Mary King take out first and second with King’s Temptress (a mare she bred!) and the lovely young grey, Fernhill Urco. (What a week for Mary after placing third at Badminton!). Third went toUSA’s new eventing star, Sinead Halpin and Manoir De Carneville. In fourth place was William Fox-Pitt and Neuf de Coeur and fifth to AussieClayton Fredericks and Be My Guest.The experience of seeing two of the world’s biggest Three Day Events is something that I will always fondly remember and am so glad to have experienced. If you ever get the opportunity, I highly recommend it! Witnessing the very best eventing riders has been inspirational for me and really motivated me to improve my own riding. After returning from this trip, I have experienced improvement and increased success with my own horses. I finally ticked another goal off my list by competing (and even placing!) at CNC* level. I look forward to the future and definitely haven’t ruled out another trip….it might just take a while to get back there again!